Shiragiku (means "white chrysanthemum") training planes were used during the Battle of Okinawa by the Navy's Kamikaze Special Attack Corps to make suicide attacks. The Naval Air Groups at Tokushima, Kōchi, Ōi, and Suzuka formed special attack squadrons from Shiragiku trainers, but only those from Tokushima and Kōchi made sorties toward Okinawa from Kushira and Kanoya Air Base respectively. During May and June 1945, a total of 108 airmen (56 from Tokushima Air Group and 52 from Kōchi Air Group) lost their lives in special attacks by Shiragiku trainers. The Yashima Special Attack Squadron with Shiragiku trainers was formed at Ōi Air Base in April 1945, but the war ended before this squadron could carry out any attacks against the enemy fleet. 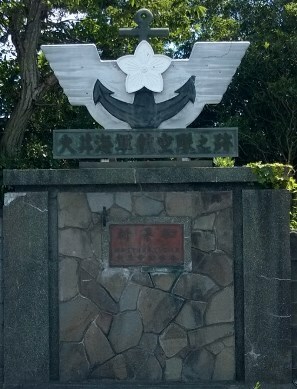 The former Ōi Naval Air Group was located here at Nunohikihara on a site with a total area of about 300 hectares. This monument is part of the Air Group's gate. There was another gate column about 12 meters from this front part, and it was used as an entrance and exit to the air base. In April 1940 it was communicated that an elementary school building and 200 houses would be cleared from this area, and construction proceeded. The Air Group formed in April 1942. Many airmen were trained here, and special (suicide) attack training started from April 1945. It is recorded that there were about 3,000 Air Group members in total who were here. In this area there are underground shelters and tunnels that remain. In addition, a jishō (time bell) that indicated the time in those days and a Shiragiku trainer engine that was pulled up from the sea off Miho Coast in Shimizu City are on display at the Makinohara Community Center. Inside there are also photographs and records from that time. Please stop by. Haibara Town merged into Makinohara City in October 2005. 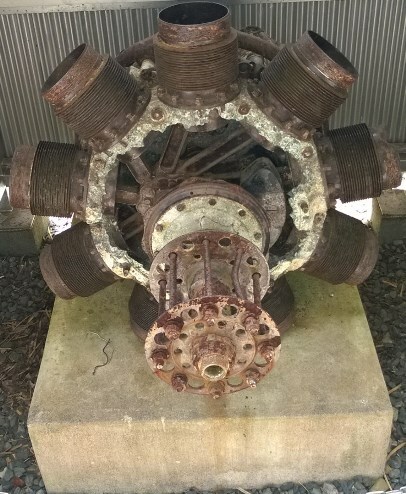 The sign behind the Shiragiku engine on display at Makinohara Community Center, a short distance away from the Ōi Naval Air Base Monument, provides a history of the engine type and its technical specifications. The jishō (time bell) now on display at the Makinohara Community Center stood in front of the Ōi Naval Air Group Headquarters from April 1942 until the war's end. There are four wheels on display in an exhibit next to the Shiragiku engine. They probably belong to a Shiragiku trainer, but there is no explanatory sign to confirm this. In the same area as the wheels there is a Naval "spirit stick," which was a club used by Navy officers to beat men to instill "spirit" in them.